Original Cuisine uses only the finest ingredients, freshly prepared English free run Chicken, Scottish Salmon, North Atlantic Herring, Traditionally reared Suffolk Duck and Whole Egg. High levels of Taurine essential for your cat's health. The recipe is based on the Ancestral diet of your cat with a high content of quality animal protein aligned to a cats natural food intake. Nutritionally complete food with a high content of quality traditionally reared freshly prepared Suffolk Duck, grass reared Lamb, Rabbit, Venison and whole Egg. Based on the Ancestral diet of your cat with quality protein aligned to a cats natural food intake. 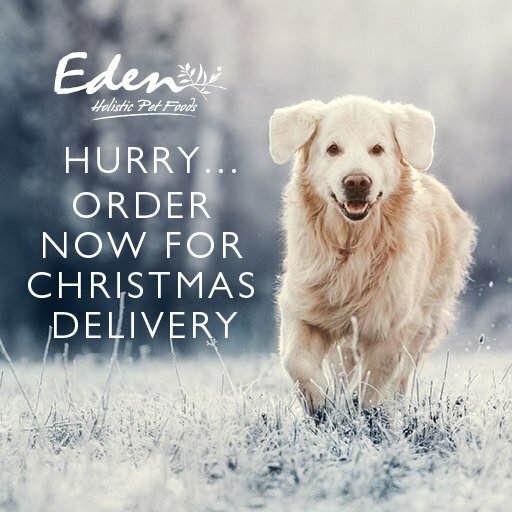 Eden Original Cuisine is a naturally hypo-allergenic, nutritionally complete wet food formulated with a high content of quality animal protein and low carbohydrate content, based on the Ancestral diet of cats. with 70% freshly prepared, human grade quality Chicken and Salmon, with Peas, Sweet Potato, Carrots, Blueberries, Goji Berries and Minerals. Made with fruits and vegetables to ensure a low carbohydrate content. Health supporting herbs, organic vitamins, and minerals for optimum absorption. Added joint supplements and prebiotics to support digestion. All Eden products have been formulated without grain, gluten, or white potato. Eden Turkey and Herring is a naturally hypo-allergenic, nutritionally complete wet food formulated with a high content of quality animal protein and low carbohydrate content, based on the Ancestral diet of cats. with 70% freshly prepared, human grade quality Turkey and Herring, with Peas, Sweet Potato, Carrots, Blueberries, Goji Berries and Minerals. Eden Country Cuisine is a naturally hypo-allergenic, nutritionally complete wet food formulated with a high content of quality animal protein and low carbohydrate content, based on the Ancestral diet of cats. with 70% freshly prepared, human grade quality Duck, grass fed Lamb, Rabbit & Venison, with Peas, Sweet Potato, Carrots, Blueberries, Goji Berries and Minerals.